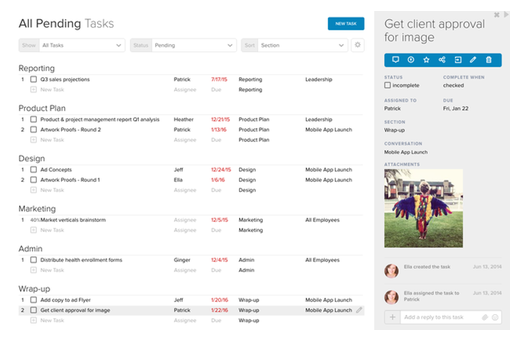 The Tasks app shows all tasks across all of your conversations in a format that is more conducive to project management. Within each conversation stream, you can see relevant tasks in the right pane, but the Tasks app lets you view all tasks within and across conversations. Click the Tasks icon on the left navigation bar to access the tasks. Click on any task in the list and its Details view will slide in over the right pane (as depicted below). You can view all of the task's details here, see its history, and add replies. • View all tasks, your own task list, tasks assigned to a specific person, tasks posted by a specific person, or tasks from a specific team. If you have any of your teams organized into folders, you can also select the folder so that you can see just tasks associated with teams in the given folder. • Show pending tasks, completed tasks, or both. • Group tasks by the conversation they were posted in, by color, by section, by due date or by assignee. These options allow to you take a higher level view of what's going on across all of your conversations/projects, and even do some project management. Maybe you want to look at all tasks grouped by due date to see what's coming down the pipe. Or maybe look at all tasks assigned to Lisa to see what her workload is like. Add a new task by clicking on the New Task button at the top of the page, or click on one of the New Task rows at the bottom of each grouping of tasks. Before you start adding tasks in-line (i.e., via the New Task rows), though, it's important to understand which conversation the tasks will get posted to. If you have the Tasks app filtered to show just tasks for a specific team, any tasks you add will be posted to the given team. If you have the Tasks app filtered to show All Tasks, and have them grouped by Conversation, then tasks you add will be posted to the conversation corresponding to the grouping you're in. In most other cases, absent an explicit conversation context, any tasks you add will get posted to a conversation between you and the given assignee(s). Or, the Me conversation if there is no assignee, or the task is assigned to you. When you click or tab into the Assignee field a form will pop up for you to enter one or more assignees. Just start typing a name and a list of matches for you to select from will appear automatically. If you need to assign the task to someone that hasn't yet been added to RingCentral App, just enter their email address and they'll automatically be added when you post the task. Headshots for everyone in the given conversation are displayed at the bottom the form (so long as the conversation doesn't have more than 40 people), and you can add someone as an assignee by just clicking on their headshot. Click on the green icon at the end of the list to add everyone in the conversation as an assignee. QUICK TIP: Create a new section by entering the section name in a New Task row immediately followed by a colon (e.g., “Phase I Tasks:”) and then hitting either Enter or Tab. Tasks can also be pasted into the Tasks app in bulk (up to a maximum of 25 at a time). Just click on one of the New Task rows and then paste. Each line break in the pasted text will signal the start of a new task. Only task names can be added this way so make sure the text you copy is only one column of data. To edit a task, just click on its row and change the values as needed. To edit information that isn't displayed in the list of tasks (e.g., description, start date, color selection, file attachments, etc. ), click on the pencil icon displayed at the end of the task's row. Tasks can be reordered via drag-and-drop. Just place your mouse over the Index column (i.e., the numbering of each row) at the start of any task's row and click-and-drag on the grid that appears over the task's number. When the Tasks app is sorted by section, due date, assignee or color, you can actually change the section, due date, assignee or color for a task by dragging it into a different grouping. When sorted by section, you can also reorder the sections themselves by dragging the section headers. QUICK TIP: When you have the Tasks app grouped by Section, the section names are editable. Just click on the section’s name to start editing. NOTE: Changes to a task's completion status or assignee will trigger automated messages to the conversation in which the task was posted so that all of the appropriate people are aware of the change. Click here to see some examples. The gear menu at the top-right of the page allows you to change some of the default behavior of the Tasks app. • Show Grid Lines - Displays horizontal separators between each task. • Show Columns - Allows you to add additional columns to the display in the Tasks app. If you’re doing basic task management, just having Due date may suffice, but for more advanced project management you might want to also display Start date and Days. There's also an option here to "Show Sort Column". To save space in the Tasks app, the field that you are sorting on isn't displayed as a column. Select this option if you'd like the sort column to be displayed as well. • Show Assignees - Assignees can be displayed by their names or their headshots.